In the process of selecting an appropriate host for the heterologous expression of functional eukaryotic membrane proteins, Drosophila S2 cells, although not yet fully explored, appear as a valuable alternative to mammalian cell lines or other virus-infected insect cell systems. This nonlytic, plasmid-based system actually combines several major physiological and bioprocess advantages that make it a highly potential and scalable cellular tool for the production of membrane proteins in a variety of applications, including functional characterization, pharmacological profiling, molecular simulations, structural analyses, or generation of vaccines. 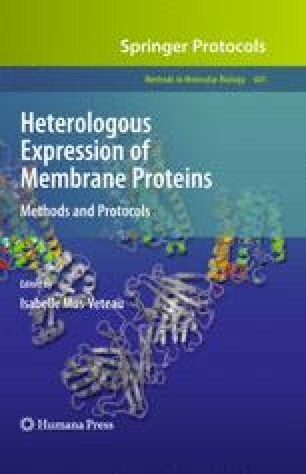 We present here a series of protocols and hints that would serve the successful expression of membrane proteins in S2 cells, using an enhanced green fluorescent protein (EGFP)/G protein-coupled receptor (EGFP-GPCR) as a model.